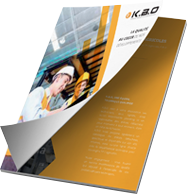 K.B.O offers customers maintenance contracts to ensure that their products remain reliable and continue to satisfy your performance criteria. Customer satisfaction is one of the company’s key values and that goes both for the implementation of air conditioning and its use. That is why K.B.O has a dedicated, accredited team for handling refrigerants and ensuring that products last for a long time. Our customer service department will answer your questions regarding maintenance or repairs and put you in touch with specialist teams.